All straps are top of the line hand stitched. Choose from the selection below. Please note, all Jodi Head Guitar Straps are made to order in our shop in NYC. Please allow 7-14 days for your order to be processed. Thanks for your support! Made by hand in our shop in NYC. 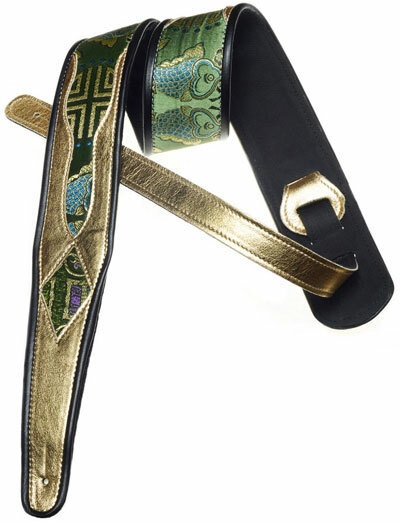 2.5" wide lush, metallic brocade straps. Leather lining with complete leather body and leather binding. Fully adjustable tail to 55" long (60" length available). Made by hand in our shop in NYC. 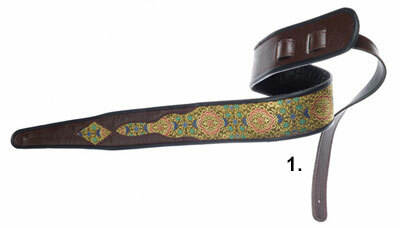 2.5" wide lush, metallic paisley brocade straps. Leather lining with complete leather body and leather binding. Fully adjustable tail to 55" long (60" length available). Available in blue, purple and black. Made by hand in our shop in NYC. 2.5" wide heart brocade strap. Leather lining with complete leather body and leather binding. Fully adjustable tail to 55" long (60" length available). Made by hand in our shop in NYC. 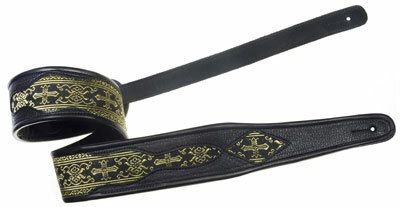 2.5" wide lush brocade strap. Leather lining with complete leather body and leather binding. Fully adjustable tail to 55" long (60" length available). Made by hand in our shop in NYC. 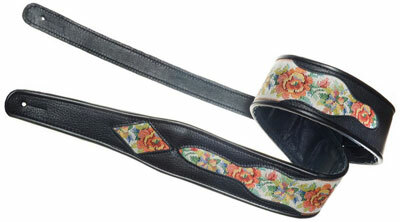 2.5" wide lush brocade straps. Leather lining with complete leather body and leather binding. Fully adjustable tail to 55" long (60" length available).